18th-century maps of the Delmarva Peninsula are frustratingly short on details when it comes to roads. The major routes are depicted, of course, like the well-known stage road from Salisbury to Laurel Town, but when it comes to some of the minor routes alluded to in land surveys from the first half of the century, researchers are left guessing. Waterways are usually the best geographical features to use as reference points, being more or less stationary and often (but not always) retaining their colonial-era names, but many of those ancient footpaths and roads still exist under the paved surfaces of modern highways. It’s just a matter of figuring out which ones. As I don’t know exactly where Wingate’s land was located (“ye north side of Broad Creek” is a rather large area), I’m only speculating, but this so-called horse road may have originally linked the Nanticoke reservation known as Broad Creek Town and the Indian River Indian reservation known as Askecksy (among other, similar names), both of which were settled as early as 1705. The town of Laurel now occupies the site of Broad Creek Town, while Askecksy was located south of present-day Millsboro, near Injun Town Road or Indian Town Road. It is known that the residents of these Indian towns had settled there to escape English encroachment, and had contact with each other, despite belonging to different tribes; in 1742, they met in the area roughly between the two reservations known as Winnasoccum or Wimbesoccom, and planned to attack the local English settlers, as explained here. Shortly thereafter, the Indian River Indians sold their land, and most of the Nanticokes migrated to Pennsylvania. By 1748, the road in question may have been used almost exclusively by the English, and may have led directly to the mills located near the branches of Indian River, rather than the old Indian lands located a few miles south of them. I’ve crudely spliced together maps of Broad Creek Hundred and Dagsborough Hundred from the Pomeroy & Beers Atlas of 1868, which was the first map of the area to show its extensive network of unpaved roads, and highlighted the route that the horse road of 1748 may have followed. Eventually I’d like to complete a map of the entire area as it looked during the colonial era, but for now, this rough mash-up is better than nothing. Recently I decided to create a series of maps depicting the Broad Creek area during the colonial era. Many of the local place names have changed since then, making it difficult to describe where anything was. It’s all well and good to explain that Gray’s Branch used to be known as Sockum Creek, and Wimbesoccom Creek before that, but it would be helpful to be able to point to Wimbesoccom Creek on a map. Maybe there is such a map, but I haven’t found it, so I’m in the process of creating it. The following map is part of a digital tracing of an old map of the peninsula, plus several place names dating back to the early 1700s — say, between 1705 and 1735. (Most of the names date back to the 17th century, but some of the English creek names only date back to the 1720s and 1730s.) Eventually I’d like to create a map based on a modern map or satellite imagery, but this is a good first step. The text should be clear when viewed at full size. The locations of the Indian villages are approximate. There were many others, of course, some of which are well-documented and can be added to future drafts, and some of which are shrouded in mystery. For example, it was once reported that there were ten Nanticoke villages, but John Smith only visited four or five of them (Nause, Arseek, Sarapinagh, Nantaquack, and/or Kuskarawaok, which might have been another name for Sarapinagh), and colonial records only name Chicacoan Town and Broad Creek Town. 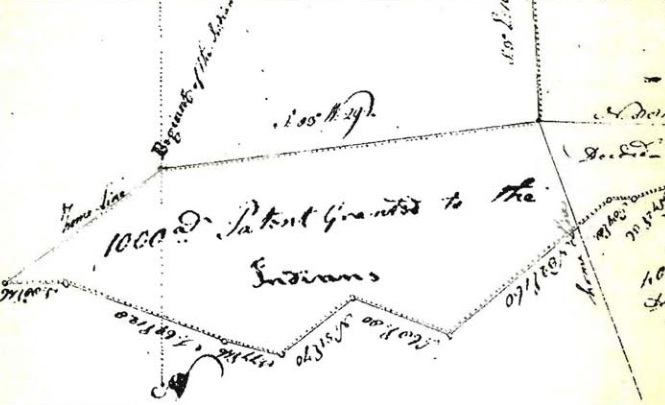 The location of Broad Creek Town is based on atrocious photocopies of old land records in a folder at the Laurel Public Library, which hint at, rather than show, the location of the reservation created in 1711. Most, but not all, of the Nanticokes’ land was on the north side of the creek. It should be noted that there is at least one reference to “Broad Creek towns,” plural, but all of the other colonial documents I’ve studied refer to only one town or village. Rossakatum Branch, located east of Little Creek, doesn’t appear on this map. I’m unsure about the identity of Bald Cypress Branch, which was described as a branch of Broad Creek. (Not to be confused with the Bald Cypress Branch that flows through Gumboro and into the Pocomoke River.) If it wasn’t another name for Raccoon Branch, the source of Raccoon and Trap Ponds, then it might have been the next branch to the west, later known as Tresham or Trussum Branch. Bald cypress trees can still be found on both branches. The map I traced to create the base layer of waterways didn’t show Chicacone (or Chicacoan, as it was usually spelled) Creek, so I drew a squiggle in that area and placed Chicacoan Town next to it. The location of Askeckeky, also known as Askecksy, Ackequesame, Askakeson, etc., roughly corresponds with the location of the modern road named Injun Town Road or Indian Town Road. Now a back road, this road was once one of the main routes to Millsborough, and perhaps an Indian trail during the colonial era. When I started thinking about creating a blog about Delmarva history, folklore, and genealogy, my first thought was, Yet another blog. I’ve published one about politics, one about religion, and contributed to several others. It seems like I’m always telling people about the latest blog I’m publishing or contributing to. But, as a matter of fact, I haven’t written for any blog in over a year. So, yes, this is yet another blog, but it’s also my only blog at the moment. I decided to create this blog for several reasons. First, I’ve been interested in genealogy — family history research — since I was a kid, and although I periodically share stories about and photographs of my ancestors on Facebook, I’d like to share that sort of information on a site that anyone can stumble upon. Second, I’ve been working on a short book-length history of Laurel, Delaware, since November, and I frequently come across information that just doesn’t fit into the book. Sometimes, pages of research boil down to a single sentence. I’ll share some of that “overflow” material on this site. Third, I’m interested in learning what others might know about a particular subject — like the Nanticoke village at Broad Creek during the 17th and 18th centuries — so I hope that posts about such subjects will provoke discussion. Concerning the name of the blog, I chose Peninsula Roots on a whim and will probably change it several times. Once I settle on a name, I’ll buy the domain. I liked the name Between the Bays, but apparently that’s already a thing. Peninsula Roots will suffice for the present.